The true nature that most of you have at birth is pure joy and love. Each one of you comes from the same Source, beautiful and full of love and light. Know that you have within you the power to regain control of your life. It will take time and effort to undo the things that you have allowed, but it is well worth the effort to make the change if you truly want to experience peace and joy on a daily basis. In ancient Mayan times, as well as many other cultures, each birth was celebrated. Every child upon entry into this world knew they were loved. Each knew they came to this earth for a purpose. Each was supported by the entire tribe. How much better this world would be if you returned to the simple act of loving your babies unconditionally. This cannot happen until you love yourselves unconditionally. You can do it! Each and every one of you has the ability to go within and do some major housecleaning. Swipe away those cobwebs of disillusionment, sweep away those thoughts of low-self esteem and mop up all those memories of sadness and despair. It is time to wash your windows and let your light shine. Remove the walls and the moat full of alligators and let others in. All it takes is the desire to clean up your mess. Roll up your sleeves and begin, knowing that once you get your life under control and clear out the mess, it will be easy to maintain. Once the major work is completed, you will find yourself energized and with time on your hands to enjoy more creative endeavors. Take responsibility for whatever situations you currently find yourself. Be grateful for every experience you have had. Learn from those experiences and make better choices for yourself and your life will unfold magnificently. Please include this web address when posting or sharing with others. It is time to gather together and visualize the world you wish to create. Working together, take the necessary steps to create this dream into reality. No longer can you sit idly by waiting for everyone else to do the work. Roll up your sleeves and delve into the work at hand. Together you can make it a reality. Each of you has unique talents. Decide for yourself what role you wish to play during the transition. No role is too small; however, there is the risk of taking on too much. Decide for yourself which skills you have that you enjoy, then find ways to use them to build the dream. Be creative and think out of the box. Leave plenty of time for rest and recreation. You only bring more negative energy into the world if you push yourself too far and become exhausted. Do what brings you joy and energizes you. Treat each other with respect. Focus on your commonalities, opening your minds to new ways of thinking. Take time each day to take care of your needs and then spend as much time as you choose taking care of the needs of others. Get a clear focus of how you want to live your life and then take the steps to create it. Decline offers that lead you from your Path. Stay focused each moment. Please include this web address when posting and sharing with others. by Theresa Crabtree in Mayan Messages. Today we would like to celebrate YOU! How often do you take time to be grateful for the person you are? If you would do this more often (every moment), your life would be much grander! We begin by saying, “Thank you!” Without your experiences on Earth, our lives would not be as enriched. By having the privilege of working with you, our lives are filled with joy. Take time now to thank yourself. Know that every thought, word and action you have ever participated in has spread throughout the universe. Even those things you judge to be bad are not considered negative by us. When people do things that are “bad,” they allow others to make a choice in how they will respond. There would not be an opportunity for such if no one played the role of bad guy. Just like in the movies, the bad guy is an actor. It is not the actor being bad, he is just playing a role. Although from your perspective the “bad” may feel painful and horrible, from our broader perspective, we know you are playing temporary roles. We mention this so you will thank yourself and celebrate your Being without judging yourself or regretting choices you made in the past. Know you are a child of love and are pure in your Spirit Essence. Celebrate this. Treat yourself to a big astral hug by calling in your Spirit Guides. Play soft music and allow yourself to relax and release any pressures you have placed on yourself, allowing your Essence to be filled with their love. Daily, take time to look in the mirror and tell yourself how wonderful you are. We are truly grateful for each moment we have in which we are consciously connected. There are many ways we are connected, since energetically we are of the same Essence. When you are knowingly aware of us and desire to work together, there is a highly charged energy frequency that occurs between us. This is similar to an electrical conduit. When you have electric lights in your home, they are always hooked up to the same energy source as all the other electrical appliances in the building. When you decide to light up a room, you simply flip a switch and the energy flows through that conductor. It is much the same whenever you have an interaction with us or any other Being or experience. There is always the possibility for a myriad of choices to occur, yet it is the one you focus your mind on that will manifest. Thus, be mindful of what you wish to experience, for you have within you the power to make it so. There are often things that manifest in ways you do not desire, there are several reasons why this occurs. Since you live in a world with more than six billion persons, there will be times when you simply are a receiver of something that was not consciously intended specifically for you. If it is something that goes strongly against your paradigm, your Guides will send messages to assist you in avoiding being part of that scenario. It is up to you to be tuned into their frequency and to recognize and choose whether to follow their guidance. When there are natural disasters, accidents or people affecting others in unkind ways, you may be prompted to avoid going into the areas where these things will occur. By hooking in with your Higher Self and Guides, you will more likely heed their advice and remain safe. There are many who have lost their lives or suffered physically or emotionally because they did not listen to their inner voice. On a more personal level, when you turn on your connection with your Higher Self and Guides, the lights come on and the current flows, oftentimes bringing you the gifts and joy you desire. To allow the energy between you to flow freely, you must remove any blocks. When you have fear, negative thinking or disbelief, it is like having the light switch in the “off” position; the flow is blocked. When you release belief codes and habits that keep you in fear, it is similar to turning the switch into the “on” position. 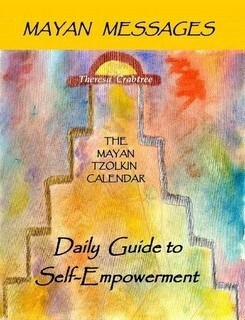 To read this Message in its entirety, scroll to Day 185 at: http://mayanmessages.wordpress.com/days-183-195/ Please include this web address when posting and sharing with others. Posted October 30, 2015 by Theresa Crabtree in Mayan Messages. INFINITE POSSIBILITIES When you make a clear intention that you desire a specific thing to occur, such as a job that pays well and is more inspiring, you begin to take steps to make this goal a reality. You begin to note synchronicities that happen during the day, following leads and checking out various opportunities (doors). Each step, you pay attention to your intuition and gut feelings, deciding if these opportunities are truly what you want. Do not settle for anything less. Create situations that will make things happen; choose doors that best fits your needs. Know that sometimes what appears to be a wrong door could lead you to something better. Perhaps by taking the “wrong” door, you met someone or gained skills that led you to the door of your highest choice. The key is to not be swayed by fears and belief codes. Have courage in yourself and know that in reality, there are no wrong doors. There may be missed opportunities, yet within these lie myriads of learning experiences and adventures. Move on through your day, seeking doors of opportunities. To read this Message in its entirety, scroll to Day 164 at: https://mayanmessages.wordpress.com/2015/10/30/day-164-infinite-possibilities/ Please include this web address when posting and sharing with others. MERGE WITH SELF When you have your attention in more than one place at a time, there are things you are likely to miss, such as when you are writing emails and talking on the phone at the same time. Meanwhile, you have dinner cooking on the stove and know you will have to turn off the garden hose in a few minutes. Your thoughts are fragmented and distracted. At these times, it is likely errors or accidents will occur. Perhaps you will forget to include an important idea in your email. By not giving full attention to the person you are speaking to on the phone, other opportunities may be missed while you have your attention diverted elsewhere. Soon, many of you will be merging with your Higher Selves while you continue to live in your physical form. Can you imagine the possibilities when you are fully in remembrance of your pure Self, yet still have the ability to enjoy the blessings of Earth? No longer will you be distracted by a myriad of things. When everyone has full remembrance of their Spiritual nature, there will be no need or desire for war and greed. Abundance will come in all realms of your existence, for you will know how to create your desires out of thin air. Your life at this time is like living in two places at once, creating much confusion and many distractions. Once you merge with your spiritual Self while fully embodied in physicality, there will be nothing that you cannot attain. All of you will still be bound by the basic laws of the universe. These rules are not arbitrary, they were created as a means to allow this game to occur. You have been playing the game that included forgetting your spiritual roots. This was necessary in order to experience Not-Love. However, many of you have now purchased the new, updated version which allows you to play on the same game board, but with a new rule, one in which you are merged with your Self. Take time to ponder these words. Even if you do not believe it is possible, you can still play the pretend version of the game. Either way, live your life as though this were already true, that you have a spirit nature that is all love. Make your choices from this belief. Choose only things that bring you joy and happiness. Be kind to others. Pay attention to how you impact your world. Spend time in Nature. Choose jobs and recreational activities that enhance your passion.